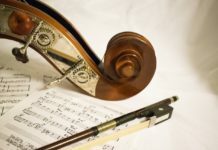 Buying a cello can be expensive, especially when you are first starting out, so you want to make sure that you are buying the right beginner cello. You want to buy a cello from a company that is known for making great beginner cellos at an affordable price. In this article, we will tell you about our favorite cello brands for beginners to make sure that you are getting the best cello for your dollar. Our list of the best cello brands below is based on quality and affordability. It is intended to help you select a high-value cello brand that fits within your budget. It doesn’t make sense to spend thousands of dollars on a new cello when you have no idea whether your student will continue playing cello for long. Every cello brand on this list may not suit your individual personality. You need to find a cello that sounds right to you and that you know you will play for a long time, but also fits in your budget. Cellos are expensive instruments, usually costing between $200-$5000 depending on the level of quality, so we wanted to make sure that we provided you with a list of the best cello brands. Buying a cello online is a fairly recent phenomenon so if you don’t feel comfortable buying an instrument online, we recommend trying out cellos at a local music shop before you shop online for the best deal. However, if you feel comfortable with Amazon’s return policy, you can certainly buy from them and return the cello if it doesn’t sound quite right. 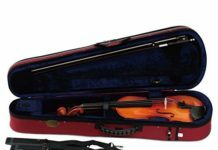 The following cello brands are brands that we recommend to the beginning student. The brands on this offer sufficient value for their money that we believe they are perfect for beginners. If you are looking for a cello for an intermediate or advanced student, please check out our guide on the best cello brands. Use this list as a guideline for which beginner cellos to buy. While not every cello brand on this list will fit your budget, experience level, or other search criteria, we hope it provides a great baseline to begin your search. 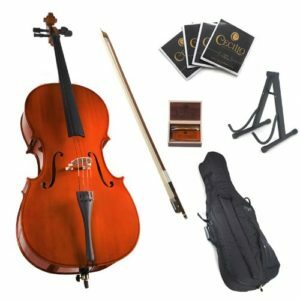 Cecilio, one of the most well-known cello brands, makes great instruments for beginners. Their cellos are high-quality at an affordable price. We love Cecilio cellos for their cost to value ratio. Cecilio makes great beginner musical instruments including cellos. If your student is unsure about whether they will continue playing cello, Cecilios make a great option as a first cello. Cecilio cellos are hand-carved from tonewoods with spruce tops, flamed maple sides and back, and inlaid purfling. This gives their cellos a look that exceeds their modest price point. These cello outfits come with everything you need to get started, including a quality brazilwood bow with unbleached Mongolian horsehair and both a soft and hard case! Great value for your money. Given the value you get for the price, the Cecilio cello brand gets our highest vote. Stentor cellos have made a name for themselves by making good quality cellos at an affordable price, similar to Cecilio. Stentors are great instruments to learn on before transferring to a professional cello. We like these beginner cellos and highly recommend them if you’re not into the Cecilios. 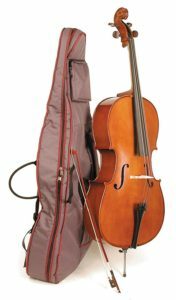 Stentor is sure to have the right cello for your student, from absolute beginner to slightly below intermediate. They come in a variety of sizes and are very sturdy, a plus for parents worried about durability while being transported to and from school. Stentor cellos are crafted out of solid tonewoods and include a solid ebony fingerboard, pegs, and fittings with maple sides and back, and a spruce top. The starter kits on Amazon come with a cello bag, bow (usually brazilwood), and rosin. Cremona cellos make great beginner instruments for a decent price tag. 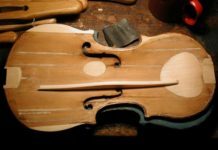 While the parts are made in China, Cremona cellos are assembled in California, so there is definitely American craftsmanship involved. Made out of select tone woods, such as hand-carved maple, spruce, and ebony, these cellos perform pretty well as-is, but can sound a lot better with minor improvements. 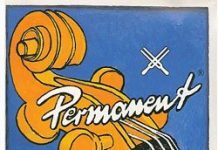 Out-of-the-box, Cremona cellos come with Prelude strings which are okay, but swapping them out for a higher-quality cello string brand can make a world of difference. Cremona cellos are manufactured in the Cremona workshop in California using MENC standards. The MENC standard ensures that the instruments are playable out-of-the-box, and can be easily integrated into your child’s school orchestra or ensemble. Each outfit on Amazon is shipped with a high-quality Brazilwood bow and a cello bag. Primavera cellos are a very affordable beginner/intermediate cello brand. 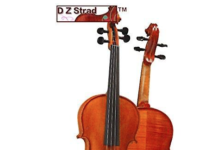 Slightly more expensive than many of the beginner brands ($600-$1000) on this list, Primavera cellos are made out of high-quality solid tonewoods, including hand carved maple and spruce with inlaid purfling. The fingerboard and pegs are made out of carved ebony, as well as the fittings. 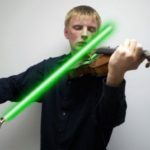 In addition, the Primavera intermediate cello outfit comes with a “student-proof” (ie. sturdy) composite bow with an ebony frog and Mongolian horsehair. Primavera has made several decisions to cut costs while improving the musical experience. For example, they use a metal alloy tailpiece with four fine tuners, instead of a solid wood tailpiece. They also use a Styrofoam shaped case instead of a standard “pillowy” case. 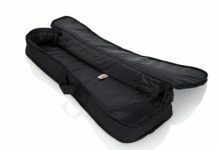 While slightly lower in quality, this case still performs well and will protect your cello from the elements and drops. Primavera beginner cello outfits come in many sizes, so you can find the proper fit for you or your child. Most also come with a hardwood bow and soft case. Merano’s make great beginner cellos for those who are very price-concious. Most of their cellos sell for a little more than $200, and while you won’t be able to sell them for much, they will meet the requirements of any beginner who needs a basic instrument to get started. Merano fingerboards are not made from ebony so you will probably need to replace the fingerboard at some point if you keep it for long enough. If you are on a budget, Merano cellos will work well. Outfits on Amazon include a ton of extras including an extra set of strings, an extra bridge, rosin, cello bag, music stand, and electronic tuner. Buying a Merano cello outfit is one way to be up and playing in no time. 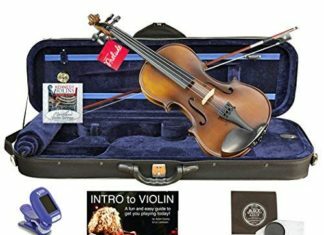 The beginner cello outfits above come with everything you need to get started playing, but you may still need some accessories or upgrades. Check out our “Buying a Cello Checklist” guide to make sure you have everything. Hopefully, this guide helped you in your cello brand selection and best of luck learning how to play!